As the HEAL Cities & Towns Campaign has matured over the past three years, LiveWell Colorado has learned how some cities are able to use the Campaign to move HEAL policies and the implementation of given policies forward for their community. One of the key findings we have uncovered is the value of establishing a HEAL committee. HEAL committees vary in the number of members and the affiliation of members (staff, resident, community partner, etc), but the benefit is consistent – with a HEAL committee, municipalities have a group focused on increasing access to healthy eating and active living and as a result, these cities tend to make progress more quickly than others. Below, learn how the cities of Northglenn and Commerce City have used their HEAL committees to make great gains for the city and bring a healthy living lens to city policies and planning documents. The Northglenn HEAL Committee formed as a result of the HEAL Cities & Towns resolution passed by city council on July 14th, 2014. The committee is comprised of seven community members as well as seven staff advisory members from six city departments and meets on a monthly basis. The HEAL committee seeks to identify and influence policy areas that will contribute to the overall health of the Northglenn community. The committee plans to accomplish this by engaging the community and making recommendations to decision makers for further advancing Northglenn’s commitment to improving access to healthy foods and active living by influencing the built environment through these policies. During the first year, the Committee focused on learning about health assessment tools, policies that other municipalities have adopted that advanced the mission of better health through the built environment, and programs that can encourage healthy behaviors. Based on research, guest speakers, and discussion, the HEAL committee developed a work plan that outlines the future policies and programs that the committee will work towards in the near term, as well as some that it will look at for possible future implementation. The committee will make recommendations to the city council regarding projects and policies that can improve health outcomes. The committee intends to investigate items identified as future projects and policies to determine the health benefits and cost implications associated with them. The work plan also outlines the committee’s role in looking at projects that the city is currently undertaking or has already identified in the budget. The work plan provides the committee with goals/objectives and strategies to meet these goals. Identifying barriers that individuals have to participating in community engagement events and recommend ways to reduce these barriers. Recognize ways the city can attract and incentivize healthy food retailers and promote and encourage locally grown healthy foods. 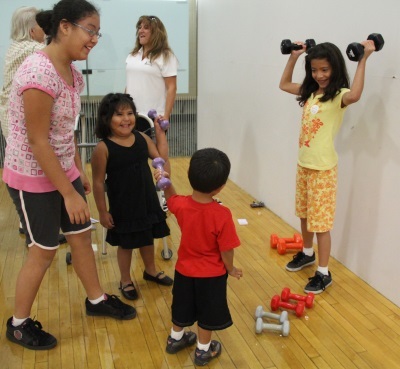 Identify policies that can reduce barriers to physical activity and enhance access to active living for all citizens who live, work, and visit the community. A public health benefit supporting the policy or program recommendations – if available, the recommendations will include evidence-based research that supports the project or program. An estimation of the budget implication, if any – adding new programs or policies can require funding considerations; recommendations will have an estimated budget attached to aid the Council Members in their decision making process. Additional benefits beyond health – some policies or programs have additional benefits beyond encouraging healthy lifestyles, for example, economic benefits, maintenance benefits, etc. Recommendations will include additional benefits foreseen by adopting a policy or program. Adopted the Northglenn Food Access Assessment via resolution – done in partnership with the HEAL Cities & Towns Campaign. The report identifies gaps in the community where healthy food access is lacking or limited, suggests additional study and/or outreach to bolster the data, and ultimately provides guidance to decision makers regarding policies and programs the city can adopt that will improve access to healthy, affordable foods for the community. Larson Park improvements – through city funding and significant grant funding from Community Development Block Grant (CDBG) and Adams County Open Space, the city had the opportunity to recreate Larson Park as an exciting new place for children to play. Adult outdoor fitness equipment was also installed at the park. Pilot Bike Repair Station – A bike repair station will be installed in October at E.B. Rains Jr. Memorial Park. It will include the tools necessary to perform basic bike repairs and maintenance, such as flat tires or brake adjustment. Riders can hang the bike from the arms, making repairs easier. The goal of the station is to remove barriers from people being able to ride their bike by providing access to tools to preform basic repairs themselves. Vending and Concessions Assessment – in partnership with Tri-County Health Department (TCHD), the city is evaluating current vending and concession options. The City will use a report and recommendations from TCHD to look at ways to phase in healthier food options. Create recognition program for innovative wellness program/strategies. As a result of the committee’s work during the last two years, Commerce City became the first Colorado community to reach Elite status within the LiveWell HEAL Cities & Towns campaign, integrated HEAL principles into new capital and maintenance projects, and partnered with its nonprofit partners to educate residents on container gardening, and expand healthy food access to local food banks. 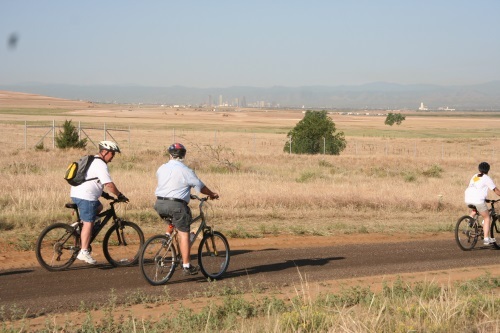 Refuge Master Plan: Commerce City participated in and endorsed the Rocky Mountain Arsenal National Wildlife Refuge Master Plan in 2015, approving new trails and trailheads that will connect to the existing network of Commerce City trail system. Referred capital improvement ballot measure: The city referred a ballot measure in August 2013 to provide a dedicated one-percent sales and use tax for the construction, operations and maintenance of new parks, recreation and road projects. The measure passed in November 2013 with 54 percent of the vote. The adopted Station Area Master Plan has a pedestrian and bike components, and the city is investing $2.5 million to make connections to the new commuter rail station. An innovative Tower Road design (completed in 2014), which has on-street bike lanes and a 12-foot multiuse path that also includes a public fruit tree respite area with seating for families and other users. This project is part of the ballot measure and construction began in May 2016. Bicycle and pedestrian improvements are being designed for the Highway 2 widening project. A Safe Routes to Schools project on E. 72nd Avenue between three schools will begin construction this summer. A new 2.5-acre, $10 million outdoor leisure pool – Paradice Island Pool – opened to residents in July 2015. The new 20-acre Fronterra Neighborhood Park opened to residents in August 2015 as part of a $3 million capital project. With the employees of the municipal workforce, achieved 80 percent unique users (252 employees) in city wellness program in 2014. Offered more than 30 events including lunch-and-learns, wellness challenges and wellness events in 2014. Adopted a policy in 2014 to provide employees with a floating holiday if employees participated in two wellness program events. In 2015, made this a contract requirement for the AFSCME collective bargaining unit, to include completing a health wellness survey and program participation for eight hours of additional leave. The city drafted a memorandum of understanding for the Commerce City Food Bank Network in 2015 and serves as an active network member to provide improved coordination and healthy food access to local food banks. The city’s 2014 land development code does not prohibit donations of backyard produce. In 2014, city employees created an organic CSA and held several lunch and learns on healthy eating tips and demonstrations in 2015. The city’s Quality Community Foundation funded $7,500 for local food banks to secure refrigerated storage.